WHY DO I WANT HIGH FPS? If you find gameplay smooth at 60 FPS and are playing the game semi or fully casually, that’s fine. Some of these tweaks can be invasive to the performance of other applications and it’s up to you to determine whether they’re worthwhile doing. That said, it has been said before that animations in BDO are loosely tied to your framerate. I say loosely because doubling your FPS over 60 to 120 will not give you a 200% casting speed or running speed. Some players have said that animations can get about 12-15% faster at 144 FPS compared to 60 FPS, while some players report no difference. Higher FPS will also register your key presses faster. Pearl Abyss initially released a patch a couple months ago locking input registry to 60 cycles per second, but overall scrapped it when it created a lot of bugs – especially revolving around using mounts. I am unsure if they will be implementing it again. Until then high FPS is king. It’s up to you to determine whether it’s worth it for you or not. Disable low power mode. This one’s a big deal. If you AFK lifeskill, disable it anyway. The game is reduced to 3FPS when in tray, so you don’t have to worry about it. Low power mode makes the game sleep for about 10ms every frame to use less resources. Only useful if you’re on a high end rig and streaming so more resources are available for OBS. 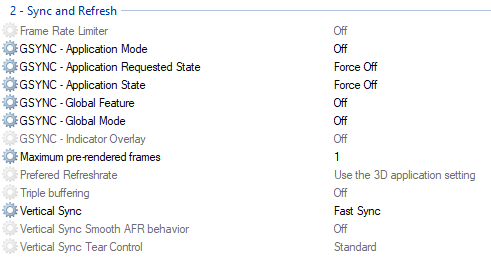 Disable all the options in Optimization (Beta) except Movement Frame Optimization and disable Auto Frame Optimization in the regular optimization settings. If you have a weak GPU you can enable Upscale to boost performance greatly. It can be pretty jarring when the game suddenly turns on optimization settings. Using Effect Optimization and putting the slider between the mid-point and Prioritize Effects seems to use lower quality effects for other players without disabling them completely, unless you’re already on Optimization mode. In Display Settings -> Display Quality, scroll to the bottom and enable Remove Faraway Effects. This will disable effects for characters on the edge of your view radius, stuff you don’t need to see. Leave Remove Other’s Effects off unless you have performance issues in large scale content. An edit, this removes effects about 40-50 units away so if you’re spectating someone else’s duels in RBF you won’t see their effects. It might also remove Sorc balls at max range so just double check this setting for your use case. If you have a desperately weak GPU, you can use both upscale and crop mode in the Display -> Game Window settings to drastically reduce the render resolution of the game and boost framerates. If you play on Very High and experience occasional stuttering but otherwise great FPS, reduce your settings to high. The only difference in visual quality between these settings is the level of detail on distant models. Skill effects also seem a bit more optimized on High while still looking great. Restart your game after changing quality presets or draw distance will be messed up. Faraway NPCs and Faraway Objects in graphics settings can make you stutter in densely populated NPC areas like Heidel and Calpheon. Personal preference as to whether you change it or not. I personally can take the performance hit to not have blobs as all the townspeople until you’re 2 feet away. I’ve only had this issue after switching to my GTX 1070 from a R9 270X, so I would say that while AMD isn’t immune to this bug, you are much more likely to have vsync off work just from Radeon Settings. That said, one setting that affects people globally and creates this bug is disabling fullscreen optimizations. If you have fullscreen optimizations disabled in the application properties of BlackDesert64.exe, CoherentUI.exe, or Black Desert Online Launcher.exe; this could be introducing the vsync bug even in fullscreen and you should uncheck Disable Fullscreen Optimizations in the compatibility options under properties for these apps. Download driver 390.77. All version 400+ drivers I’ve tested have had vsync off not apply in borderless window. Clean up your driver installation using Display Driver Uninstaller, preferably from Safe Mode. Install driver 390.77 using a clean install (extreme tinfoil/paranoia here), under advanced options. I personally also opt out of Geforce Experience, but that is up to you. Download Nvidia Profile Inspector and use it to disable all GSync settings for either the global profile or the Black Desert profile. If the Black Desert profile doesn’t work, try the global profile. Your settings should look like this, either using Fast Sync or Vsync Off. I set pre-rendered frames to 1 to reduce latency as well. If this does not work for you your current install of Windows 10 may be bugged. The Fall Creator’s Update (v1709) had an update to the way the Desktop Window Manager and Game Mode worked which bugged out vsync implementation in quite a few games. Updating your system normally to the Spring Creator’s Update or the newest doesn’t fix it as it’s considered a personal setting during the update process. The only way to fix this bug is to install the most recent version of Windows 10 from scratch using an ISO. If you are using Windows 10 N edition, you need to install the Media Feature Pack. If you’re an Intel user, you can still try this out but I don’t guarantee any performance benefit. While Ryzen is a huge step up from anything AMD’s offered before, some applications don’t make the greatest use of AMD’s implementation of multithreading and the latency overhead caused by the Infinity Fabric mesh can reduce performance in response time sensitive applications like gaming. Black Desert is one of these applications that gets hit by both of these issues. Rather than disable SMT and disabling cores outright on the CPU, we’ll only be changing settings within Windows to optimize CPU load balancing for BDO and leaving it default for other applications that still use the cores well. Download Prio – Process Priority Saver so your changes to affinity save between computer restarts. 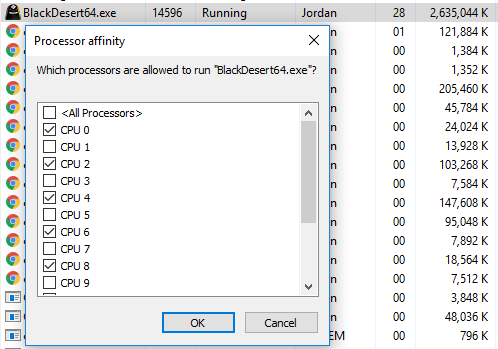 Find BDO in Task Manager and Set Affinity so that only even or odd numbered cores are enabled. Core 0 and Core 1 are threads on the same physical core, and so on. For possible additional performance, you can enable only cores on the same side CCX. On a Ryzen 7 1700 for example, it uses a 4+4 CCX which is a 4 core die meshed with another 4 core die using Infinity Fabric. Infinity Fabric runs at the same speed as your DDR4 memory, so if the memory clock is lower than your CPU core clock it can bottleneck traffic between the cores. For example, enabling only cores 0, 2, 4 and 6 on a Ryzen 1700 processor uses ONLY physical cores on the same CCX and eliminates the infinity fabric bottleneck. I wouldn’t go lower than 4 physical cores though or you’ll introduce stuttering as BDO is actually well multithreaded and quite CPU demanding. 4 cores should be fine for any setting Very High and below, but Remastered mode uses more CPU hungry effects so you’ll need to enable more cores. Overall if you’re not sure how to go about this, just disable odd-numbered cores for a nice performance boost from not using SMT. I don’t even disable cores on opposing CCXs as the game does use many threads. Just re-tested the affinity settings, it’s best to disable odd-numbered threads but not disable cores on opposing CCXs. This will get your GPU utilization as close to 100% as possible. If you have high speed memory, make sure your XMP profile is enabled in the BIOS and you’re running your memory as fast as possible. Ryzen loves high speed memory due the infinity fabric implementation I mentioned earlier. I also do not overclock my Ryzen processor for BDO. In fact, when going from stock settings on a Ryzen 7 1700 up to a 3.85Ghz 1.35v stable overclock I went from 105-140 FPS to 70-95 FPS in open field on a GTX 1070. It also introduced huge stuttering in towns and when using skill effects, and drastically reduced my performance in node wars down to as little as 18 FPS with other players’ effects on. In contrast without an overclock I can run effects on during node wars just fine. I tested heat output and stability with other applications as well and it was completely stable. Only BDO was negatively affected. Incoming edit, I am currently re-testing and adjusting my overclock for BDO. If you’re having poor performance on an overclocked chip though, I highly recommend disabling it until you can spend time perfecting your settings specifically for BDO. While Windows 10’s game mode doesn’t positively or negatively impact the performance of the game, it greatly negatively impacts the performance of other applications while you’re playing. Open the Windows Game Bar using Windows key + G while in game, and disable Game Mode if it’s enabled. It should be disabled by default. For example when encoding in OBS I don’t drop any frames. With Game Mode on I start skipping 80% of the frames and playback is choppy. BDO is impacted the same from streaming regardless whether game mode is on or off, so it’s poor load balancing for other applications while game mode is enabled. My best guess is game mode makes each CPU core the game is using exclusive to the game, but I’m unsure as to its implementation. There is one interesting bug that I’ve found while playing BDO that I can’t seem to find a definitive solution for. Disabling SMT and cores on opposing CCXs alleviates it a bit, but does not get rid of it completely. The issue is that while the game is out of focus, the framerate is higher than when the game is in focus by as much as 15%. If anyone has the same issue and has a solution I would like to know what it is to add it to this guide.